Keep your napkins sparkling white by treating stains quickly. 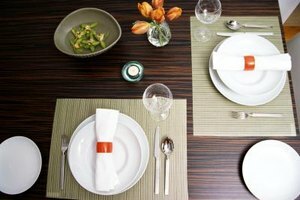 White cotton napkins lend a crisp, formal touch to your place settings, making them ideal when serving meals to guests. They can also save you money when you use them daily, because you won't need to buy paper napkins. This eco-friendly option has one drawback -- white napkins can become stained with food, wine and lipstick. Depending on the stain, you might need to use one or more pre-treatment techniques to get your napkins white again. Saturate any stains with a commercial stain remover or undiluted lemon juice. If using lemon juice, sprinkle the saturated spot with table salt and rub the salt in with your fingertips. Allow the napkins to sit for 30 minutes. Fill a sink with steaming hot water and add 1 cup of white vinegar. Place the napkins in the sink and allow them to soak for two to three hours. Wash the napkins in the washing machine on a regular cycle using hot water. Add laundry detergent to the water if using a top-loader or the dispenser if using a front-loader. Add a stain-removal treatment to the wash water. Try one scoop of oxygen bleach, 1 cup of liquid chlorine bleach, 1/2 cup of white vinegar or 1/2 cup of powdered borax. Hang the napkins on a clothesline or clothes-drying rack outdoors or in front of an open window and allow them to dry in the sun, which provides extra bleaching action. If any stains remain after washing, repeat the pre-treatment and laundering process. Putting stained items in the dryer sets the stain.